Downtown San Jose is the densest, most walkable, most transit-oriented and most dynamic place in the South Bay. It’s now poised to benefit from the growing trend toward working and living in urban centers. But downtown needs more people. After decades of investment in buildings and public spaces, it has the room and the amenities to welcome many more workers, residents and visitors. As the number of those enjoying downtown city life begins to grow, the vitality and dynamism of the place will, too. 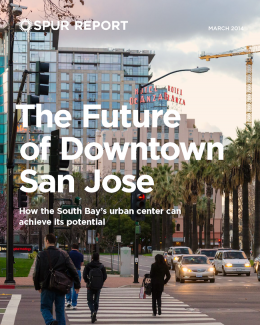 The Future of Downtown San Jose identifies six big ideas for achieving a more successful and active downtown, then lays out the steps for making them happen.